Do you know that particular line in movies when characters eat something strange and exotic and they say that “it tastes like chicken”? Has anyone ever asked what part of the chicken did it taste like? Did it taste like chicken breast or like chicken thigh? Let us look more into this since there are many people out there who do not really understand the difference. Cooks easily and goes in a wide variety of dishes; great in diets, a bit dry. Cooks faster than chicken breast and goes in a wide variety of dishes; has more flavor and is juicier. Chicken breast is the cut of meat coming from the chicken’s breast. It is considered white meat because it is light colored. Nutritionists often recommend chicken breast in diets as is contains few calories and a lot of protein. 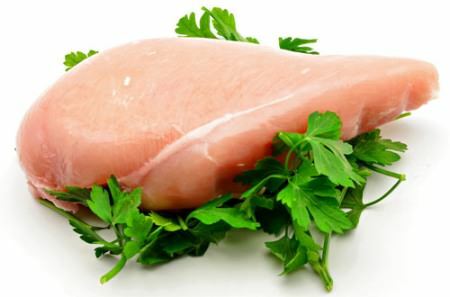 3 ounces of skinless chicken breasts have around 130 -140 calories, 1 gram of fat, no carbs and 27 grams of protein. Chicken skin contains more fat and should be removed by people on a diet. The great thing about chicken breast is that it can be easily cooked in a wide variety of ways: fried, boiled, grilled, put in a casserole, poached or baked. It can be used in sandwiches, in salads, in soups and in many other ways and it goes well with a lot of other ingredients. You can usually buy it already filleted, on the bone and with the skin, or on the whole chicken. Prices vary according to how close the piece of meat was brought to the cooking prepping phase. The closer it gets from the wrapper directly into the pot, the more expensive it is. Chicken thighs are the upper part of the chicken’s leg, the part from the knee up to the leg joint. This is considered dark meat, mainly because of the color, as well as the fact that the type of muscle it is made of is considered “worked”. This means that it is tenderer and more flavorful. 3 ounces of skinless thigh meat contain around 170 calories, 12.8 grams of fat, no carbs and 22 grams of protein. Being so tender, thighs cook easily and go well with a variety of other ingredients. They can be grilled, roasted, baked, boiled, fried etc. They go great with sauces and many people love them with all sorts of glazing or coated or breaded with various cereals. You can buy them boneless and skinless, on the bone and skinless, or on the bone and with the skin. There is also the option of getting the thighs directly off the whole chicken, but that would mean getting only 2 pieces. Chicken thighs are rather accessible. So what is the difference between chicken breast and chicken thighs? 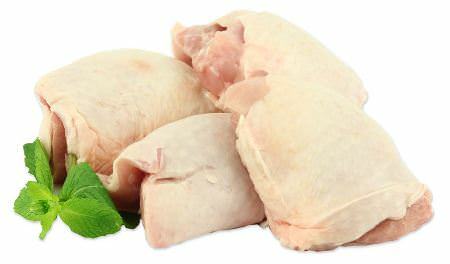 Chicken breast comes from the breast, and chicken thighs are the upper part of the leg. Buying a whole chicken means enough chicken breast for a separate dish, but only 2 thighs. Apart from the part of the bird each cut comes from, breast is considered white meat, whereas thighs are considered dark meat. White meat is considered healthier because it is less “worked” by the animal while alive. Chicken breast has fewer calories, less fat and more protein than chicken thighs have. It also costs more, as healthier options usually do. Both of them can be cooked easily and are available in stores with or without the bones and skin.